Genuine replacement/spare goggle lenses for 100% Racecraft & Accuri & Strata goggles. Choose the lens colour along with the type of lens you require. 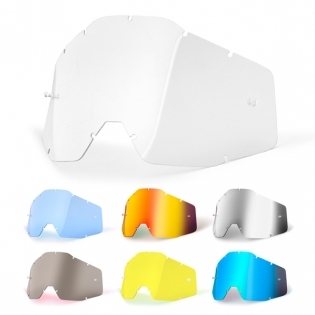 Genuine replacement 100% Lens - All 100% MX goggles share the same lens and tear-off profile. Anti-fog, scratch resistant Lexan® lens for unimpaired vision complete with tear-off pins. Please note: Fits all Racecraft, Accuri & Strata goggles.